A pullout shelf system can transform your kitchen cabinets and shelves into storage space that’s truly useable and accessible. Instead of trying to reach something at the back of a cabinet, you can simply pull out the shelves so that you can clearly see and reach stored items such as dishes, and pots and pans. 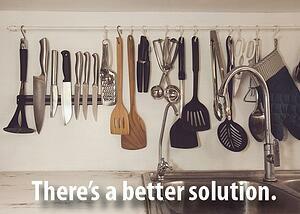 Another storage conundrum is what to do with all of your kitchen utensils. You can either load your kitchen drawers with them—and then dig around in the drawers to find the utensil you want—or you can take up valuable countertop space with bins to hold egg whisks and spatulas and the like. You might want to consider pullout organizers designed to store these kind of utensils in a way that makes them easy to access. It’s a much more refined way to organize your unwieldy utensils—and leave your countertops uncluttered. We can help you design a kitchen that not only looks better, but helps you store the things you use in a way that makes it easier to see what you need—andto get at those items conveniently. The right solution for you may not be more space, but better, more efficient use of the space that’s available to you.